Clobazam is in short supply, but is still available at some pharmacies. If inventories have become low or depleted at your pharmacy, ask your pharmacist to recheck the status of clobazam and Frisium with their suppliers. The next few days will continue to be challenging for people, due to the depletion of the clobazam inventory at many pharmacies. However, some replenishment of generic clobazam (Apo-clobazam, Apotex Inc.) is expected at the end of this week or early next week. The new stock will be spread across the country with limited amounts to individual pharmacies. A second replenishment of generic clobazam (Apo-clobazam, Apotex Inc.) is expected to arrive at pharmacies by late June or early July. It is expected that there will also be periodic shipments of the brand name product, Frisium, over the coming weeks as well. Carnitor tablets are currently unavailable in Canada. This is a problem only in Canada, not elsewhere. An oral solution is still available in Canada, but due to the sugar content it is not suitable for patients on the ketogenic diet. There are Carnitor tablets available in the US and the Health Canada Special Access Program (SAP) is processing applications to obtain the tablets from the US until this issue is resolved. If you think you might be affected, contact your physicians about applying to the Special Access Program or email us for more information. Over the past few days we have had reports that pharmacies are having difficulty getting clobazam from their suppliers. This suggests that the clobazam shortage is worsening. The best source of information about the supply of your medication is your pharmacist. The situation will vary from one drug store to another, depending on the amount their supplier has available, whether the pharmacy keeps stock of this drug on-hand or orders it as needed, and other factors. See below for estimated resupply dates. Pharmascience discontinued PMS-Clobazam in April 2015. What should I do if I take clobazam (Frisium)? If you or one of your family members take clobazam, we advise that you contact your drug store and ask about the supply of this medication. If your pharmacy is unable to refill your prescription, another pharmacy may be able to. Contact your healthcare provider for medical advice if you are unable to get your prescription refilled. Clobazam is a benzodiazepine and should not be stopped abruptly. If clobazam is unavailable, your healthcare provider may prescribe an alternate drug to prevent benzodiazepine withdrawal and to control your seizures. Work closely with your healthcare provider and your pharmacist throughout the shortage. If you need information or assistance regarding a drug shortage, please contact your local epilepsy agency by calling 1-866-EPILEPSY (1-866-374-5377). Apotex Inc. posted a shortage of Apo-Clobazam in early December on drugshortages.ca. No explanation has been provided. The estimated resupply date for Apo-Clobazam has changed multiple times, initially it was April 15, 2016 then it was extended to September 1, 2016. The newest resupply estimate is November 30, 2016. Teva-Clobazam (also called Novo-Clobazam) from Teva Canada Ltd. is also on back-order and new shipments are not expected to be available until September 30, 2016. Frisium is on allocation, so pharmacies can only order limited quantities. There have been no reports, so far, on drugshortages.ca from Teva Canada Ltd. or Lundbeck. Brand name divalproex sodium (Epival) is expected to remain in shortage for several more months. The estimated resupply date for all strengths of Epival is July 22. Based on this estimate, it would reach pharmacies in late July or early August. Specific dates are listed below. Teva Canada Ltd. will be releasing several batches of generic product, Teva-Divalproex, over the coming weeks. Each resupply will help, and there is more scheduled to be coming behind it. Teva Canada Ltd. has released a detailed statement describing the company’s plan (see attachment). Apotex Inc. and Health Canada are working to resolve the Apo-Divalproex shortage and more information is expected in the next few weeks regarding availability of this product. The available supply is being shared across the system. Pharmacists may provide partial refills during this time to help the greatest number of patients maintain access to this important medication. The availability of generic divalproex sodium is expected to improve over the coming weeks. The Canadian League Against Epilepsy has also produced a document for physicians and prescribers: Divalproex Shortage – Suggestions for Management of Patients with Epilepsy. A number of antiseizure drugs produced by Apotex are currently listed as in shortage on the drugshortages.ca website. Here is a summary produced by Epilepsy Ontario staff. There are fewer companies in the market now as compared to when we had the two severe clobazam shortages affecting multiple manufacturers during fall 2012/winter 2013 and winter/spring 2014. Pharmascience discontinued PMS-clobazam last year (spring 2015). There have been shortages of all 3 tablet strengths. The 25 mg and 150 mg shortages were resolved in November. One strength is still in shortage: 100 mg tablets. Estimated resupply date March 31, 2016. NB> there were shortages of these 3 Apotex products 6 months ago as well, but Apotex did not provide any notification on drugshortages.ca during the summer 2015 shortages of Apo-Levetiracetam. Pharmascience has been in shortage on their levetiracetam products for an extended period of time (posted on drugshortages.ca since June 25, 2015, current resupply estimate for PMS-Levetiracetam is July 1, 2016). Mylan has posted an extended back-order of MYL-Pregabalin, no resupply date. Pfizer discontinued GD-Pregabalin in 2015. Pfizer is still marketing Lyrica (brand name pregabalin). There are several other companies with Health Canada approval to market pregabalin. We don’t know how many of the companies listed on the Health Canada drug product database are currently marketing pregabalin. NB> companies that purchase from Apotex and sell under a different label are also in shortage on this product (Sanis Health, Pro Doc). Teva-Divalproex is being rationed, it is listed as “on allocation” on the drugshortages.ca website, and one strength of Epival from BGP Pharma is currently in shortage (250 mg Epival tablets). Due to the severity of the shortage, there will be restrictions on the amount of that pharmacies can order. If you or a family member have been prescribed divalproex sodium (Epival), contact your pharmacist and ask about the availability of your medication. If your pharmacist runs into any difficulty obtaining divalproex sodium they may be able to find some from a different supplier, another drug store, or another chain. February 11, 2016 – The Canadian Epilepsy Alliance/Alliance canadienne de l’épilepsie is calling on drug manufacturers to take real steps to ensure patient safety and reduce shortages of anti-seizure medications, beginning with public disclosure of what is causing the shortages. It is with tremendous concern that members of Canada’s epilepsy community have watched the on-going problem of drug shortages develop over recent years. “The seemingly endless situation of one or more anti-seizure medications being in shortage has significantly worsened over recent weeks,” said CEA President Deirdre Floyd. “Across the country the supply of an essential medication, divalproex sodium (Epival), has been hit by recent shortages. A major Canadian pharmaceutical company is out-of-stock on multiple epilepsy drugs. This needs to stop and that’s not going to happen until we know why it’s happening at all”. The Canadian Epilepsy Alliance’s call for greater commitment on the part of pharmaceutical manufacturers to addressing and explaining the causes of drug shortages follows years of increasing uncertainty in the supply of prescription drugs. Patients and pharmacists have often been left scrambling to fill prescriptions when unannounced or extended interruptions take place. For many people with epilepsy, interrupting medication or switching to a different brand can result in uncontrolled seizures and potentially serious health consequences. While the Canadian Epilepsy Alliance has focused many of its efforts over recent years to ensure that patients, pharmacists, and physicians have as much notice as possible about shortages, the shortages themselves seem to be increasing in frequency and length, with no reasonable explanation. This is unacceptable. Thousands of people across Canada rely on medication to control their seizures and the sudden change or withdrawal of those drugs can have devastating effects, including loss of seizure control, hospitalization, or even death. “We believe that manufactures with a licence to market a drug have a social responsibility to ensure a consistent, reliable supply of drugs that can have catastrophic results if patients are not able to access them,” added CEA Drug Shortage Committee Chair Suzanne Nurse. The Canadian Epilepsy Alliance is also calling on all pharmaceutical manufacturers who are experiencing or anticipating shortages of their anti-seizure medications to not only provide notice but an explanation of the reason for the disruption. “It is only with relevant information as to the cause of shortages that manufacturers, governments, pharmacists, physicians, and patients can begin to understand and address the causes of shortages” says Nurse. Inge Rylaarsdam, whose husband Richard needs one of the medications currently in short supply to control his seizures, knows first-hand how serious the shortages can be. Richard’s epilepsy is not fully controlled. When taking his normal medication, he has seizures about two to five times per month. When Richard tried to respond to the shortage by switching to a different brand, his seizures increased to five to ten seizures per day putting his safety at risk and interfering with his ability to work. “We are very fortunate that Richard is able to do so much and live life quite normally, being self employed on a farm, as long as he takes his medication and the right medication,” said Rylaarsdam. “It seems as if pharmaceutical companies are not caring about lives at stake, and more concerned about making a certain dollar amount,” she said. The Canadian Epilepsy Alliance/Alliance canadienne de l’épilepsie (CEA/ACE) is a Canada-wide network of grassroots organizations dedicated to the promotion of independence and quality of life for people with epilepsy and their families, through support services, information, advocacy, and public awareness. People can contact their local epilepsy agency by calling 1-866-EPILEPSY (866-374-5377). If your medication is due to be refilled soon, check with your pharmacist and ask about the availability of your medication at your drug store. If your pharmacist is unable to locate any of your medication for you, contact your healthcare provider to discuss alternative treatment options while this drug is in short supply. Do not make any changes to your treatment plan without consulting with your health care provider. Continue to take the same amount of medication at the same time of day as usual. Your healthcare provider can discuss the situation with you and provide medical advice. If you have been prescribed a different drug, due to unavailability of your regular tablets, make sure the dosing instructions are clear. Ask questions if there is anything you don’t understand. If you are confused or have concerns, tell your pharmacist. The Canadian Drug Shortage database is reporting a shortage of Apo-Levetiracetam in 250 & 750MG strengths, with an estimated resupply date of January 31, 2016. Drugshortages.ca is reporting a shortage of APO-LAMOTRIGINE in 25MG, 100MG, and 150MG with an estimated resupply date to be determined. 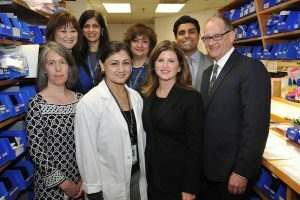 Epilepsy Toronto and its partners in the Canadian Epilepsy Alliance have been raising the issue of drug shortages that affects too many people living with epilepsy. Information on current shortages can be found at www.drugshortages.ca, an industry-run voluntary database. Epilepsy Toronto will attempt to post information on shortages of anti-seizure medication as we receive it. According to the Canadian Pharmacists Association’s guide on drug shortages, Step 1 is for pharmacists to exhaust every avenue to supply the medication. This may require looking beyond their regular sources of supply and contacting other wholesalers or calling the manufacturers. Your pharmacist also has access to resources and information through the Ontario Pharmacists Association. If the situation worsens and your pharmacist is not able to locate any divalproex sodium for you, it is important to work with your pharmacist and your health care provider to manage the drug shortage in the safest way possible. During a shortage, your pharmacist and health care provider may explore options that could include filling your prescription with a different strength tablet or substituting a different medication. If your dosing instructions change, ensure you understand the instructions and ask questions if it isn’t clear. When a drug is unavailable in Canada, Health Canada’s Special Access Program (SAP) will consider requests from health care providers for access to the drug from outside the country. The SAP can be reached 24 hours a day, 365 days a year, and the program strives to process requests within 24 hours of receipt. It is important to continue to take your medication as indicated. It can be frightening when an epilepsy drug is in short supply but skipping doses, taking less medication, or suddenly stopping an antiseizure drug is dangerous. This can lead to breakthrough seizures, more prolonged seizures or life-threatening events. Vancouver, February 10th 2015- Canadian Epilepsy Alliance members joined Federal Health Minister Rona Ambrose today as the Minister announced that Canadian pharmaceutical manufacturers will now be required to provide notice of shortages of their drugs. Currently the drug shortage notification is voluntary. Minister Ambrose’s announcement comes after years of work on the part of the Canadian Epilepsy Alliance and other organizations, raising the issue of drug shortages with Federal regulators and Parliamentarians. The voluntary notification system, where manufacturers may provide information on an industry administered website, has often seen shortages not reported until patients discover the shortage on their own. This is especially dangerous for individuals living with epilepsy where an interruption in their medication can result in serious adverse effects or even death. It is hoped that with mandatory notification, individuals can work with their physicians and pharmacists to ensure an adequate supply of the medication they require.